Yep, as per reply #24, that was my understanding too, and that it has nothing to do with discounting. I phoned them because I wanted to buy 40 mk3 coaches and thought I’d see if they do a discount, they already had them at £12 and they said they couldn’t go lower according to Bachmann, so they definitely abide by any policies laid out to them. I've read this thread with great interest! I've nothing to add to the conversation, but if it comes to a choice between Hattons and Farish, I will stop buying Farish! I'm new to the hobby but have bought from numerous retailers and Hattons is my "go to" dealer. Incidentally, I've just recently purchased a Farish GWR Railcar advertised "£75 BARGAIN List price: £94.95". Maybe I missed something in the thread posts. Finally, I'm in the United States and Hattons is the only UK dealer to deduct VAT from the list price. Also, their shipping charge is lower than any I've encountered. All leading UK model railway retailers should deduct VAT on US sales of new product, but Hattons is unusual in also deducting VAT from sale of pre-owned stock. Indeed for us in Oz if you are buying second hand it's now a choice of taking 20% VAT off the price at Hattons vs adding 10% GST on at Rails eBay store. I suspect that the rift in the lute occurred with the launch of 'Hattons Wholesale' where Hattons started offering their own range to other retailers. Escpecially given the OO class 66 this puts them in direct competition with Bachmann. Bachmann's terms and conditions do explicitly state that they can refuse to supply a manufacturer. Even the definition of manufacturer is vague as an OEM re-badge product may or may not make the seller a manufacturer. Revolution's new 56xx is an example where the model has its origins with a manufacturer that is not the badge seller, and is complicated as Revolution are having significant input on the design. My reading of the situation is Hattons have a privilege supplier agreement giving them price points in exchange for required volumes that they have either not honoured or are in dispute over. A sales outlet has no entitlement to be supplied by a manufacturer and a manufacturer is entitled to define the parameters a sales outlet must conform to if they are to be supplied. this is protect all of their sales customers and stop undercutting and dumping. On other thought is that there is a glut of unsold stock in the market that could lead to significant discounting. One way to deal with that is to constrain the supply and at the same time teach an offender a lesson. 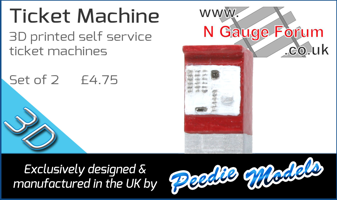 Remember N gauge is batched produced, so they don't have continuous flow production to get into the market. Any model for sale now is no longer in manufacturing it's in stock somewhere. Any recommendations for who I should move my Farish Pre-Orders to if this issue goes on for too long. Is this any different to Gaugemaster selling their own GM Collection range and also supplying this range to other model shops (class 73s, 66s, etc in N, Terriers in O, and various wagons in the three scales) albeit they are made by Dapol for GM? Just been onto Hattons site to order some wagons. 155 Farish wagons listed, out of those 155 only 18!!!! Are actually in stock. This really needs to be resolved pretty quick because from what i can see with Hattons always being the cheapest, the other suppliers really don't have a baseline price which they tried to be close to to win custom away from Hattons. A couple of others are only pennies dearer but don't carry the quantity that Hattons do. Unfortunately I dont buy 1 wagon of 3 types, we buy 10 of each. I just can't get that quantity from many. Rails keep good numbers but I detest their website, type in the EXACT item you want and then spend 20mins trawling through stuff that is of no use to me. So please Hattons and Bachmann sort it out pronto so we can keep our own stock levels up. Model Railways Direct? Kernow Model Rail Centre? If they’re a bit more expensive ask them to price match. Kernow were unbelievable on the price of stuff i bought of them last week. I was more then pleasantly surprised!! We can't price match because their pricing doesn't reflect their current stock. Obviously unknown until I ask but just thinking out loud. Don't get me wrong Hattons are a good retailer but they have not been the cheapest on the market for a good number of years. I am very careful to check prices before I buy and other retailers have been cheaper 90% of the time. This is particularly noticeable when similar sale items are being offered around all the box shifters. I feel they use their dominance in the market to charge a bit more than other box shifters as customers tend to buy from them expecting the best price. Therefore no loss in the the short term with regard to not stocking Farish but in the long term removing them as a competitor may drive prices up. I do spread my business around too because it's important to support other shops I feel... plus some can be cheaper. I bought a lot of track from track shack recently for example and a few bits from colletts. Unless the vendor is operating under a VAT margin scheme, the same VAT rules apply to second hand goods as to new ones.